We are Monumental Masons with over 50 years experience serving the Sydney community. Having helped generations of families through testing times, our aim is to provide you with the service and quality workmanship that you deserve. Also referred to as a gravestone or tombstone, a headstone can be a simple lawn memorial or be part of an elaborate full monument in cemetery. Ideally made from granite, the departing message you leave on a headstone is a mark of respect for the departed. It is also an important part of the grieving process for the family and friends left behind. If you need to build a memorial, our in depth guides below will go through the most important aspects of choosing a headstone. With so much variety, the monument you choose will depend on your tastes, budget, and cemetery section. To get an idea of what styles and designs you like, take a look through our headstone gallery. When it comes to choosing a suitable headstone, there is quite a lot to consider. This guide will go through everything you need to know about headstones, and provide expert stonemason advice for choosing the right monument. Not sure how much a gravestone is going to cost? While it’s very hard to give an exact figure, this article will go through some of the key things that influence price and provide some rough figures for the cost of a headstone. We are so happy about the memorial you created for my late mother. All our family and friends have praised the fine workmanship. Thank you for being so helpful and professional. With limited space on a monument, the message etched on a headstone needs to be meaningful, legible, and last for generations. A skilled monumental mason is responsible for this and should always advise on the most appropriate style and technique for your headstone. To give you an idea of the process and the inscribing decisions that need to be made, have a read through the sections below. 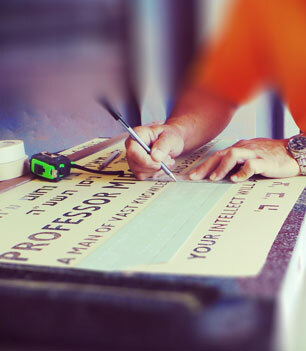 This guide covers some of the technical aspects of inscribing a message on a tombstone. It lists all the engraving, font, and lettering options offered by our monumental masons. For those struggling to craft a message for their loved one, this article provides some ideas for writing a meaningful inscription. It can be a simple layout containing name and dates, or contain poems, quotes, and much more. 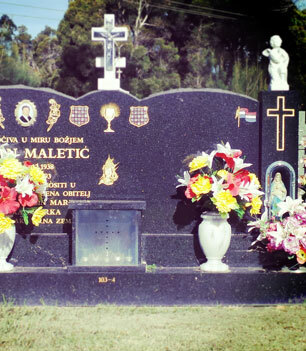 Cemeteries in Sydney have a diverse mix of different religious and cultural backgrounds. Sections can have their own unique feel of different monument styles, symbols, and tradition. A monumental mason should be knowledgeable about these traditions, and work with the family to create a memorial. 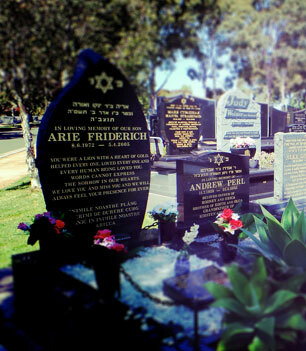 Below are some of the different denominations that are prominent in Sydney cemeteries. In accordance with religious law and values, there is a rich history and tradition for Jewish memorials. With burial still the preferred option, Catholic memorials can vary from simple lawn headstones to elegant custom monuments. If you need some advice about building a monument or wish to get a quote for a headstone, do not hesitate to call one of our monumental mansons. If you need further information relating to building a memorial or wish to obtain an exact quote, feel free to contact one of our monumental masons. Copyright Binstock & Sons Memorials Pty Ltd: All rights reserved.